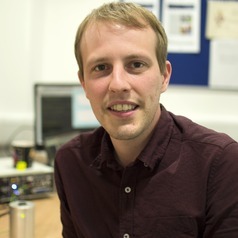 Mark Fletcher is a Research Fellow at the Institute of Sound and Vibration Research, who is looking into potential adverse health effects caused by very high-frequency sound and ultrasound. Before working at Southampton, Mark did his PhD at the Institute of Hearing Research, where he used auditory psychophysics and otoacoustic emissions to help develop methods for measuring top-down control of cochlear processing in humans. Mark also has an interest in tinnitus research and is working with a researcher from the Nottingham Hearing Biomedical Research Unit on the development of an auditory training app, which focuses on the recreation of highly realistic auditory environments.